The example was written to be simple, not efficient. The goal is to demonstrate the idea as plainly as possible, so there's no focus on performance. The code works by auto-completing the last "word" of input and then populates the list of candidates with the resulting words and the preceding text. All comparisons are case-insensitive so the user can type however they want. In a real-world application, the list of candidate words would probably be retrieved from a helper function, a database, etc..
// Ex: "he" -> "" and "he..."
// Ex: "hello there th" -> "hello there " and "th..."
Earlier today I presented two talks about the AJAX Control Toolkit at the ASP.NET Connections conference in Orlando, Florida: AMS305: ASP.NET AJAX Control Toolkit: See How to Take Advantage of the ASP.NET AJAX Control Toolkit and AMS304: ASP.NET AJAX Control Toolkit Unleashed: Creating Rich Client-Side Controls and Components. The content for these talks was based on stuff I've previously presented at TechReady4 in February and ASP.NET Connections in November of last year. However, this time around I was able to go into quite a bit more detail because I had over twice as much time to speak and do demos. The introductory AMS305 talk took the ImageFlix sample I've used before and expanded on it to demonstrate the Toolkit's new support for ASP.NET Skins/Themes and advanced animations followed by a quick walkthrough of what to do when things don't work like you'd expect (demonstrated here by adding a DropShadow to the popup panel). The more advanced AMS304 talk used an updated FontSize extender demonstration like the one that was demonstrated at the November ASP.NET Connections and included an overview of working with the Toolkit project, highlighting the automated testing framework and new localization support. Overall, there are about 15 completely new slides with fresh content, covering topics such as localization, automated testing, and more. I've attached the slide decks and the demo content for both talks to this post so that anyone who's interested can have a look at the slides or play around with the demos. I hope those of you who attended today enjoyed the talk and learned more about the Toolkit - it was great to have an opportunity to spend time with you! Yesterday I mentioned a quick C# program I wrote to help analyze storage space requirements. There was some interest in how that program worked, so I'm posting the complete source code for anyone to use. I wrote this code for a simple one-time purpose, so there's no fancy/friendly user interface. Other than adding comments and support for specifying multiple directories on the command-line, this is the same code I used to generate my chart. The code for handling last write time being earlier than creation time was something I discovered a need for experimentally when I noticed that considering only creation time reported that none of my files were older than a couple of years. Apparently when I moved stuff around a couple of years ago, the copy to my current drive preserved the file's last write time, but reset its creation time (perhaps because of the FAT->NTFS transition). 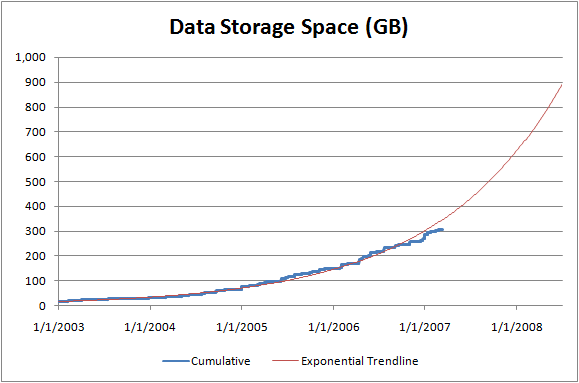 I've previously blogged about my data storage/backup strategy. Briefly, I've got one big drive in my home server that stores all the data my family cares about: mostly music, pictures, and videos (with a little bit of other stuff for good measure). To protect the data, I've got another equally big external drive that I connect occasionally and use for backups by simply mirroring the content of the internal drive. As things stand today, the internal drive is 320GB and the external drive is 300GB, but I've hit the wall and am almost out of space to add new files. Looking at hard drive prices these days, the sweet spot (measured in $/GB) seems to be with 500GB drives at about $140 (PATA or SATA). Any smaller than that and the delta from 300GB isn't enough to be interesting - any larger than that and the cost really goes up. The blue line represents the cumulative size of the data I had at each point in time (horizontal axis) measured in GB (vertical axis) - you can see that I'm just above 300GB today. The red line is Excel's exponential trend line for the same data - it matches the blue line almost perfectly, so it seems pretty safe to say that my data storage needs are increasing exponentially. I was kind of afraid of that, because it means the 500GB drives I've been considering are likely to fill up within the next 8 months! I think that data storage and backup are issues that will affect all of us pretty soon (if they're not already). Backing up to DVDs doesn't scale well once you need more than 10 or so DVDs, and backing up over the network just doesn't seem practical when you're talking about numbers this large. Even ignoring the need to backup, simply storing all the data you have is rapidly becoming an issue. With downloadable HD movie/TV content becoming popular, high megapixel still/video cameras being commonplace, and fast Internet connections becoming the norm, it seems to me that content is outpacing storage right now. Here's hoping for a quantum leap in storage technology! Updated on 2007/03/14: I've just posted the source code for the program I wrote to gather this data. 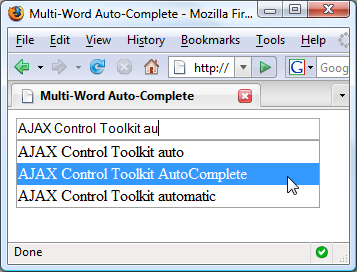 A short while ago we made available the 10301 release of the AJAX Control Toolkit. With this release, we managed to add some great core functionality, a couple of new controls, and a bunch of bug fixes for popular issues (as identified by our user community in the support forum and online issue tracker). ASP.NET Theme/Skin support - Central control is usually best, so it's nice to be able to use ASP.NET's theme/skin support to specify properties for controls across an entire web site in one central location. Toolkit controls didn't used to be skinnable (i.e., support the SkinID property) but now they are, so go ahead and start skinning your site. In fact, we used this new ability to style the CollapsiblePanels that we use for descriptions/properties/known issues on every sample page. We hope you like the new release! !